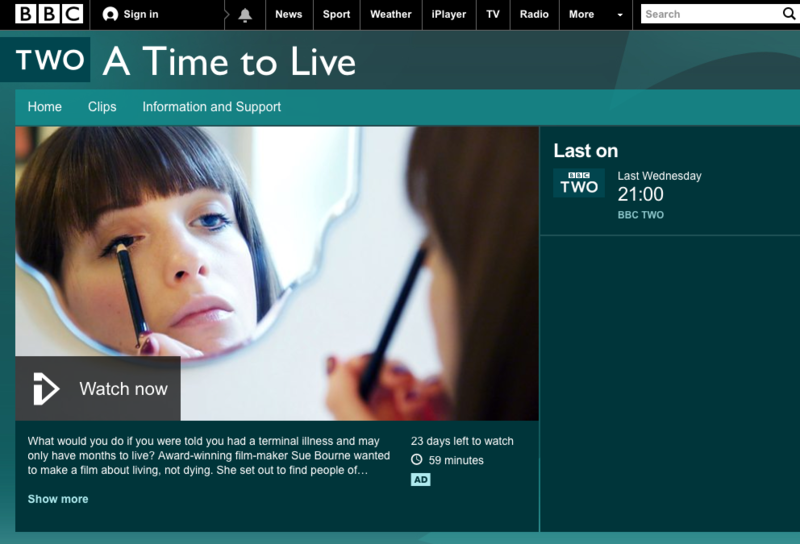 Last week, the BBC showed Sue Bourne’s A Time to Live, a moving documentary on the various mind sets of individuals who had been diagnosed with terminal illnesses, ranging from cancer to motor neuron disease. Each person was unique and had their own touching story to tell. The documentary focused on 12 people, all of whom have been given limited time to live, and explored how they intended to embrace what remained of their lives. There was a burning desire to never let a moment of their lives be wasted, all of which I found inspiring. Their motivations often had different origins, but common themes. To some, illness gave their lives a 'clarity' that they’d not had before and allowed them to develop a 'game plan'. Research supports this mindset of intrinsic goal setting, and how it leads to happiness. Mihalyi Csikszentmihalyi theorises that 'flow' (the graceful interweaving of happiness and creativity) arises only from a deep-rooted desire to fulfil your own goals. These goals or 'projects' can take whatever form pleases the person. For instance, the Marathon des Sables, a gruelling six-day challenge, was Kevin’s goal. In the case of Cindy, mindfulness helped her to appreciate every moment and the pain her body was going through, as it was her way of hearing her body speak to her. Research supports the idea that mindfulness is an enriching and successful option that could help many of us: for example, a 2013 study by Mark Williams found that mindfulness was just as effective as anti-depressants, and a study done a year later by Rebecca Crane shows that mindfulness based cognitive therapy (MBCT) reduced depression recurrence rates by 40-50% over 12 months. There were also elements of gratitude: for what you have and what you can achieve. In the case of Jolene, this was her independence, something she is determined not to let her cancer take away from her. Or to Vicky, it was her daughters, her husband and how all the 'colours are brighter'. All these 12 people have found their own way of enriching their lives, and it is their personal discovery of this that makes for such stirring viewing. If there is anything anybody can take away from this documentary, it can be a newfound motivation to carpe diem, to take hold of all the opportunities you have and to really make the most of your life, not only for yourself, but for all those around you. The documentary in itself was beautiful and delicately delivered, but not too lightly so that the true message of what these twelve individuals were facing was lost. As viewers, we understand these people not just as storytellers, but as real human beings, through what we see of their daily lives and how they interact with others. The footage Bourne provides adds diversity to our knowledge of these people, all different, all united by their terminal diagnosis. As a young person, I felt influenced by these people, but I know my mother would be equally as touched. The focus was not overly morbid, it was a mixture between the good and bad – an accurate representation of the life the film wants us to treasure and it portrayed the twelve people as people, leaving the events that follow the documentary untold, so that our focus is on their living, rather than death. In all, it was superb in its tender poignancy. - Rebecca Hill is a psychology A-level student.